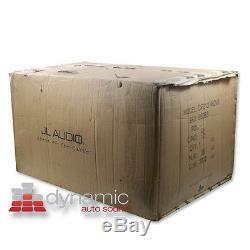 JL AUDIO CP212-W0V3 (2) 12W0v3 12&###xE2;&###x20AC;&###x9D; Subwoofers Loaded in Ported Basswedge Box. 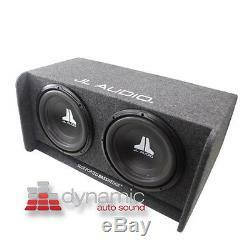 12 Single 4 Ohm W0v3 Series Subwoofer. Recommended Power Range: 100-300 watts. Mineral-filled, polypropylene cone woofer for excellent durability. Large roll surround for generous amounts of excursion. Elevated frame cooling brings air directly to the voice coil. Designed for compact sealed enclosures or medium-sized ported enclosures. 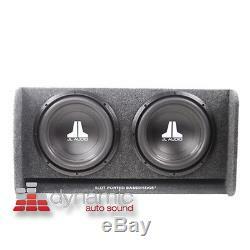 Large excursion for louder bass and less distortion. DMA Optimized motor system reduces distortion and tight, clean bass. Lead wire woven into spider for added strength. 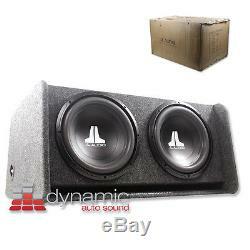 These potent slot-ported MDF-enclosed subwoofer systems fit a wide variety of vehicles. 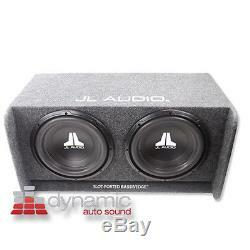 Feature JL Audio's new 12 W0v3 subwoofer drivers. Designed for forward, read or down-firing installation. Loaded, wired, ready to install. Finished in dark gray carpet, five-way binding post connectors. Embroidered JL Audio logo above woofer(s), embroidered "Slot-Ported BassWedge" logo on port mouth. 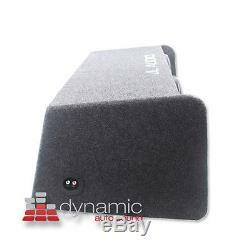 One (1)&###xA0;JL AUDIO CP212-W0v3 Loaded Ported BassWedge SubWoofer Enclosure. Since founded in 2001, customers have always been at the core of everything we do. Our enthusiastic audiophile staff are here to create the best sound systems that work for you and your needs. Expedited Services are also available. Acceptance of Contract Terms The following forms a legal agreement between you and Dynamic Autosound Inc.
By using this site you are acknowledging that you have read, understood, and agree to be bound by these terms and all applicable laws and regulations. If you do not agree to these terms please do not use this site. Any claim relating to the use of this site, its materials and any sales thereunder is governed by the laws of the Commonwealth of California, without regard to conflict of laws rules and California will be the sole jurisdiction and venue for any litigation arising from the use of or orders made on the site. 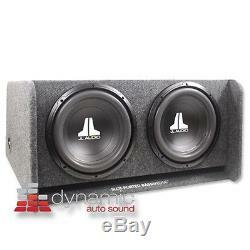 Dynamic Autosound is pleased to offer this website for the benefit of our customers and the general public. Feel free to enjoy the site as much as you like. Your choice to visit our website or to take advantage of its features does not create an agency relationship between you and Dynamic Autosound. You are free to browse our site and use its features, and in doing so you are not acting on our behalf. To the extent Dynamic Autosound provides instructions on how to use or take advantage of any feature of the site, you are under no obligation to use or take advantage of that feature. The instructions Dynamic Autosound provides are intended solely to inform you how to take advantage of any such feature, should you in your sole discretion ultimately decide to do so. Except as stated herein, none of the material may be copied, reproduced, distributed, republished, downloaded, displayed, posted or transmitted in any form or by any means including, but not limited to, electronic, mechanical, photocopying, recording, or otherwise without the prior written permission of Dynamic Autosound. This permission terminates automatically if you breach any of these terms or conditions or upon the request of Dynamic Autosound. Upon termination you must immediately destroy any downloaded and printed materials. You also can not "mirror" any material contained on this site.